The British Board of Film Classification has provided age ratings for the 24: Live Another Day DVD/Blu-Ray special features, so now we know the exact running time and amount of deleted scenes included on the disc. “Worlds Collide: When Reality Becomes Fiction” is a special feature that details how 24: Live Another Day‘s storyline was ripped from today’s headlines. It runs 6 minutes and 52 seconds. 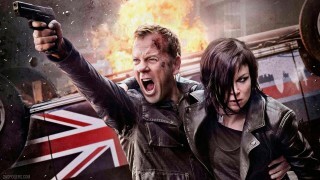 “Green Production” shows viewers how production of 24: Live Another Day was environmentally responsible. The real question is, does anyone actually care? This featurette runs just under five minutes. “Destination: London” is a featurette about shooting in London. This is perhaps the most interesting one, but also the shortest at just 3 minutes and 12 seconds. This season was filmed on location in a different country with an entirely new crew, and the best they can come up with is a brief three minute video? “24: Solitary” is a Blu-Ray exclusive “story extension” to 24: Live Another Day that involves Tony Almeida in prison. It runs 7 minutes and 6 seconds. We’ll have some more details and speculation about that in an upcoming post. There are fifteen deleted and extended scenes totaling just over thirteen minutes in length. Three of those scenes are from the premiere episode, one from episode 5, two from episode 8, and nine from the finale. Based on those scene numbers and some production data we know, it doesn’t appear there will be any alternate endings to the final scene. The last scene on this list is 1262 which was Kate Morgan’s final scene inside the CIA (Jack Bauer exchanging himself for Chloe and getting into the Russian helicopter was scene 1265). It’s hard not to be disappointed by the lack of features here. Each DVD set has been getting increasingly more barebones. Season 8 got rid of the very interesting audio commentaries and that trend continues here. This release pares things down even further by also excluding the “Scenemakers” style behind the scenes videos. There’s plenty of other things FOX could’ve put on the DVD set including the “Jack is Back” special or the recent Comic-Con panel. And still no blooper reel either. Hopefully one day they’ll re-release this set with additional content as they did with the first season. You can pre-order 24: Live Another Day on DVD and Blu-Ray. We’ll have a review up when it releases next month. I’m very interested in the deleted scenes and I’m glad 24 Solitary is longer than the initially assumed 3 minutes, but the rest is utter crap. All I want is a thorough making of in the style of the one that was on the Season 2 DVD + commentaries and bloopers. Still, I’m excited about Solitary. That “24 Exposed” special feature on the Season 2 DVD was amazing, probably my favorite special feature on any DVD I’ve ever bought. 90 minutes long and showed how an episode was created from start to finish. It was really interesting to see Kiefer’s fight choreography rehearsals and such, it makes you appreciate the amount of hard work that goes into a single episode. Fox doesn’t give a crap, apparently. Show got a critically acclaimed revival and blu-ray is so lazy. Before XAM comes here and says his usual “stupid writers and directors did this”, it’s not their decition what to include on DVDs and Blu-rays. It’s a distributor’s call: whatever they want, they get and the other way around. I don’t believe that Kiefer, Mary, Jon and others didn’t want to make an audiocommentary. FOX just wants to make everythinga as cheap as possible. Screw them for that. Nice addition to our conversation, thanks. All I am interested in, is the one with Tony in Prison! the others are utter rubbish, however I am still buying it on DVD when it comes out to complete my 24 DVD collection, Live Another Day was brilliant and lots of great episodes. I’m very interested to see the deleted scenes. However, it’s really interesting (and disappointing) that the scenes are only from 4 episodes. I’m especially curious as to what the scene from the 5th episode is, as well as the uber-long scene from episode 8 (when things go boom, ya know). I’m also hoping that the final 9 scenes may include some hints at an alternate ending, or what they were initially considering for the final version of the episode. Imagine if they someday released bloopers from seasons 1-9 (if such a mythical thing exists). I hope it involves a lot of bungled dammits. Realized I should’ve clarified “things go boom” (because this is 24, after all). More like, the episode where Heller goes boom. So many TV shows are lacking off on their DVDs at least 24 still make proper boxes not crap cardboard sleeves. Seven minutes of Tony is the only must have bonus feature I’m excited for, but I don’t have a Blu-Ray player so will just be catching Solitary on youtube. There’s really nothing to entice me to shell out the bucks for the DVD, but I’m sure it’ll still sell well enough, (which may be a factor in a Day 10 getting greenlit). Happy to hear 24:Solitary is 7 minutes. Other than that, ha, pitiful. Not buying. “24 Exposed was really the best special feature What’s up with fox selling the viewer short………? & please don’t tell me it’s to save money…….. I’ll still be getting the new season…….. but this is really a let down…….. Kiefer in interviews said we don’t wanna let the fans down……. & yet there letting fans down……… They came up with something for Tony in the DVD but couldn’t come up with a season gap for Jack?…… with this kinda season you would think they would have an hour to two hour doc……. But since season 6 they’ve really been Selling the viewer short on special features…….. & not giving fans anything extra @ all to watch……. Also, it doesn’t affect me, as I have a blu-ray player, but why even make 24 Solitary Blu-ray exclusive in the first place? It’s like showing the middle finger to the loyal fans who only have a DVD player. There’s no reason not to include it other than to make people pay more for the Blu-ray. And leaving out the best feature on a DVD release with so few features is really not a good idea. I bet many DVD-only fans will just watch it on YouTube. Also some customers may be so excited about Tony, that they don’t realise Solitary is ONLY on the Blu-ray, which will surely lead to disappointment after they pay good money for the DVD. Really stupid. Decent bluray players can be bought for under 30bucks now. I doubt that goes that far – this isn’t like the era of audio cassettes being replaced by CDs. Too many people have already invested in large personal collections of DVDs of their favorite movies, TV shows, etc. – a lot of which still aren’t available in Blu-Ray. I suspect it’s a small percentage of people who would be willing to toss all those out and replace them with Blu-Ray, and it’s probably an even smaller percentage o f people who own both a DVD player and Blu-Ray player just to play both formats. If not now, I suspect at some point (maybe if S10 comes out and a big 10-year anniversary reissue is a marketing campaign), the special feature on Tony will get rolled into a future DVD edition. I’m still waiting on a new soundtrack by Sean Callery……..
Tony Almeida confirmed in 24 Solitary?? Let’s hope the 24: solitary will be the scene that leads up to season 10 ! 24: Die Another Day with Tony & Jack! 7 minutes is enough time for Tony to break out, or be broken out of prison. Plus it won’t be a car commercial, like the previous ones, unless they try and rip off Death Race. If they can bring back Tony from the dead then they can #BringBackAudrey!!!! Stupid question: The length of the deleted scenes are minute:second:millisecond, right? The longest deleted scene is 2 minutes 11 seconds. Tony Almeida is indeed back, sporting the classic/evil Tony look.